Are you ready for the ultimate safari adventure of a lifetime? Africa Goes Wild is a 5 reel, 1, 024 ways to win online casino slot which will take you on a magical trip to the African Outback. As you make your way further into the wild jungle in the safari truck, you'll see some of the most beautiful sights on earth. You'll see elephants washing underneath a magnificent waterfall, leopards grooming their cubs, and lions roaring loudly. The design is glorious with tribal patterns and adorable animals. 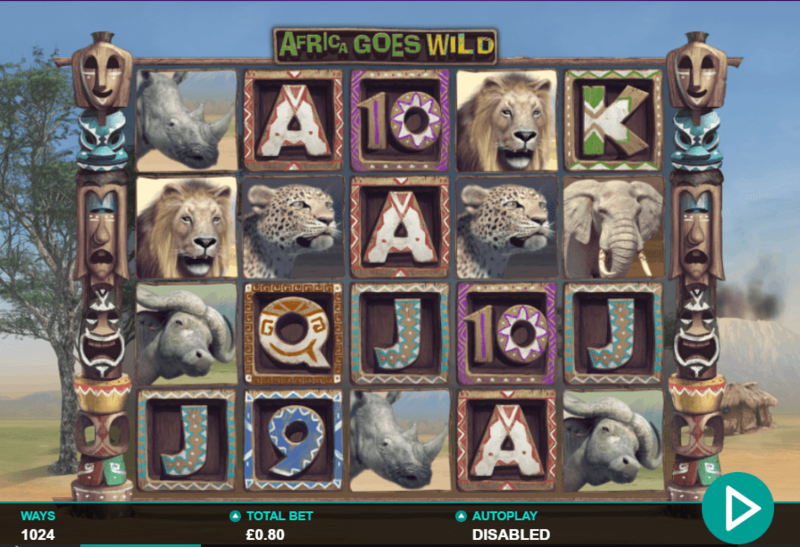 Africa Goes Wild also has some great entertaining feature including a free spins round and multiplier wilds that double payouts. Africa Goes Wild is a 5 reel, 243 ways to win slot by Leander Games with an African safari theme. Set in the African grassland savannah, you'll get to observe the behaviour of animals in their natural habitat. Rhinos stampeding, lions roaring, and cattle grazing. Behind the reels, you'll see the stunning African Outback of dry sandy terrain, warm skies, trees, and tribal men. the level of game you would expect to see on Slotsbaby.com. The symbols include playing card suits A to 9 painted in multi-coloured tribal patterns, cattle, large elephants, spotty leopards, and raging rhinos. The highest paying symbol in Africa Goes Wild is the lion. This pays up to 7.5x your total stake. The Wild Symbol - The wild symbol is the Africa Goes Wild logo and only appears on reels 2, 3 and 4. This replaces all other symbols bar the bonus symbols to form winning combinations. There are also "x2 wilds" in this slot but these only appear during the free spins bonus. Animals Go Wild feature - The animals go wild feature can be activated at any time during gameplay. During this feature, 1 animal symbol will be chosen. The chosen animal will turn any other matching symbols wild which creates a great win. Golden Lion Free Spins Bonus feature - Landing the paw print scatter on reels 1, 3 and 5 will activate the golden lion free spins bonus feature. Here you will be awarded 10 free spins. During the free spins feature, the wilds become even more exciting. Whenever a wild forms part of a winning combination, an extra 2x multiplier will be added. Leander Games is an innovate online slot provider based in Buenos Aries, Argentina. They have been creating entertaining slots since 2008, all of which incorporate exciting in-reel features such as expanding wilds and scatters. Their slots are high-quality, have amazing HD graphics, and unique gameplay. There is a Leander Games slot for everyone whether you're into something girly and sweet like Candy Spins or Egyptian Adventures like 3 Elements. If you enjoyed Africa Goes Wild, why not take a look at these Leander Games titles? If you love animals then you will adore this slot. Experience a safari adventure from the comfort of your own home. The graphics are beautifully done and the added tribal details make a great touch. The gentle soundtrack matches the theme perfectly too. 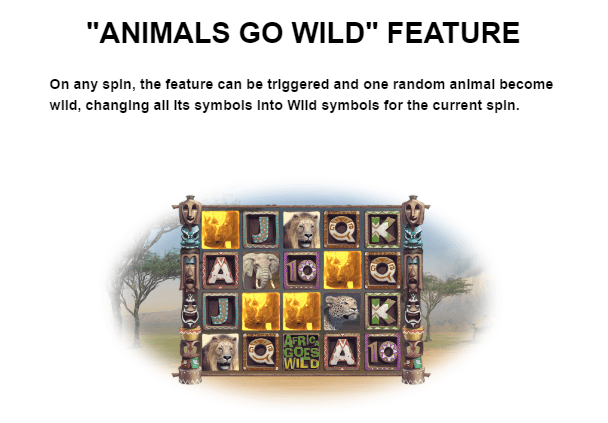 The animal wilds can help bring in lots of lucky wins, especially in the free spins feature with the extra multipliers available on this game. go to https://www.slotsbaby.com/ to find more games like this!